The idea of protein chips feels like an inherent set-up for failure. Just thinking about it reminds us of a scene from Idiocracy where clearly, plants love electrolytes. Except this time, its extremely fit people eating chips without consequence. Fortunately for your cheat days, protein chips are a thing – and they aren’t nearly as bad as we were expecting. It’s not just a case of adding protein to the chips… but most of the carbs are completely replaced. But don’t get it twisted, chips were never ‘healthy’ from the get-go (1)(2). So, while protein chips are a healthier alternative to regular carb-riddled potato chips, they aren’t necessarily a ‘healthful’ food item. With that being said, here is everything you need to know about protein chips, and how they can pleasurably fit into a health-conscious diet. For starters, what are the logical pro use-cases for protein chips? Here we lay out the top 3 legitimate times to consider adding them to your diet. Cravings are one of the biggest threats to any diet. Logically, we know that eating something high in carbs or total calories isn’t going to serve our goals. But cravings do not care, they are emotional (3). And as your will power naturally decreases throughout the day, the dark power of cravings increases! Protein chips offer up a solution to tricking your cravings. They contain the same basic crunch and taste of regular potato chips, just without all the extra carbs. Bottom Line: using protein chips as your go-to for neutralizing cravings is an excellent use case. This is referred to as a substitution item, when you replace something not-healthy for something more-healthy (4). Coming up with a quick source of protein to add to a meal to meet your daily macro goals can be challenging. While protein chips aren’t a health ‘gold-standard’ by any means, they can be a blunt solution to a daily problem. Bottom Line: protein chips can help you achieve macro balance on days where you really don’t want to go through the effort to find other protein sources. This really shouldn’t be a daily thing, but rather a time-to-time use case. 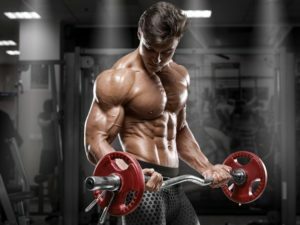 Do your best to succeed with your macros without their help! Lets face it, high-protein pre-packaged food items aren’t all that common. Yes, there are nuts… But what else are there besides straight up protein bars (that are carb loaded)? If you need a high-protein food item to travel with you on occasion, protein chips may be a simple solution to this common problem. The only side effect is, its enjoyable. Bottom line: protein chips may compete with other pre-packaged food items for transportable high-protein nutrition that isn’t a drink. What’s bad about protein chips? All things have their pros and cons. What are the cons to protein chips you ask? Here is our top 3. While the raw macros for protein chips is often around 20 grams of protein, 6 grams of fat, and less than 6 grams of carbs – which is great, this is still a food item that has gone through significant processing. This is significant because time and time again, science suggests that there is no substitute to healthy, clean eating (5). The real problems that come with processed foods even if the macros seem acceptable, is that it can slow your overall metabolic efficiency. In the scientific community, slowed cellular metabolism or slowed mitochondrial function is referred to as ‘metabolic syndrome’. Several studies have found a significant correlation between processed foods an metabolic syndrome (6). Enough so, that processed foods are included in the hypothesis for metabolic syndrome (7), while diets void of processed foods mark significant improvements (8). Bottom line: protein chips don’t grow on treas. Each chip undergoes several processing events that ultimately craft the blunt macro profile and flavor… With emphasis on flavor and texture. This often results in a micro-nutrient hollow food that the body doesn’t run its best on. Can a person make some smart exceptions to their diet, while overall staying long-term focused and loyal? That’s a tough question to answer. In the beginning stages of a diet, the answer is likely: no. However, as time goes on your willpower may be strong enough to make acceptable adjustments with macro-smart cheat foods like protein chips. Bottom line: while the macros in protein chips are relatively diet-safe, your emotional being may not fully understand, making less healthy foods even more tempting. The last potential con for eating protein chips is a heavy hitter. That is, what are protein chips really replacing in your diet? What if instead of substituting something unhealthy and calorie rich with more acceptable protein chips… You were actually replacing something healthier and more natural, with processed protein chips? Bottom line: if you really want to increase your health, physique, and longevity – protein chips may hold you back from completely ‘jumping in’ to the right diet. Now that you’ve considered your pros and cons for how to best enjoy protein chips in your diet, lets take a look at what types are out there. On this ranking, we are both focusing on which protein chips taste best as well as contain the best macro-nutrient profiles. If by the end you still can’t get enough, check out our best high-protein snacks for cheat day (coming soon)! 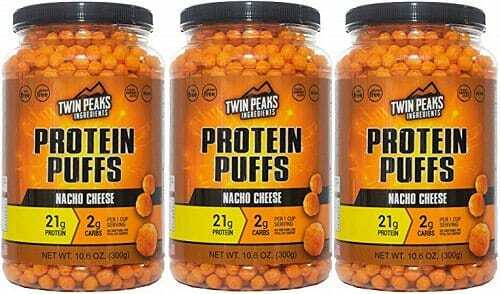 We didn’t rank Twin Peaks Protein Puffs all that highly mainly because these are not technically chips. However, they do contain 21 grams of protein per serving, which nets 120 calories but only 2 grams of carbs. Not bad at all. Ingredient wise: Protein Puffs are primarily made up of milk protein isolate and sunflower oil. Flavor wise: Protein Puffs come in a wide range of chip-style flavors. Diet: Low carb, keto friendly. Overall, Protein Puffs are a good option if you are really trying to keep your carbs down but you really aren’t focused on eating an aggressively healthful diet. If substitutions are unacceptable for you, then NutriWise’s Protein Potato Chips may be your preferred option. This is because they are simply high-protein potato chips… More protein appears to be the only difference. Due to this, we don’t expect it to fit the macro needs of most people, primarily due to the 18 grams of carbohydrates per serving. Ingreidient wise: NutriWise Protein Chips are primarily made from potato and rice. Flavor wise: Available in most typical chip-flavors. Overall, Nutriwise rankings #9 with a true potato chip that contains high protein, but also high carbs. It is no surprise to see a Vega Nutrition product on this ranking, after all, they are leaders in plant-based supplements. What does seem odd though, is that Vega Protein Crisps aren’t ranked higher. This is because compared to the other products, Vega Protein Crisps contain a lot of carbs… Something many of you are looking to avoid. Ingredient wise: Vega Protein Crips are mostly made from rice meal, brown rice protein, and pea protein. Flavor wise: Vega Protein Crisps come in sweet chili and garlic & herb. 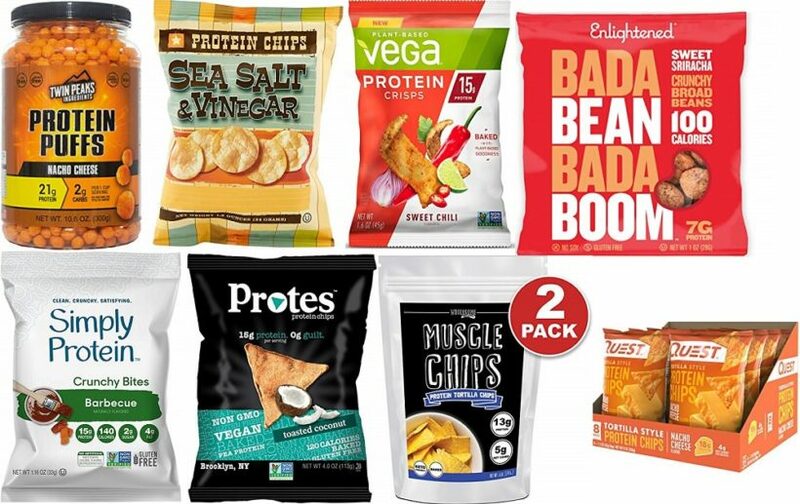 Overall, Vega Protein Crisps are a good vegan alternative to regular chips… Just you’re going to still be getting lots of carbs. 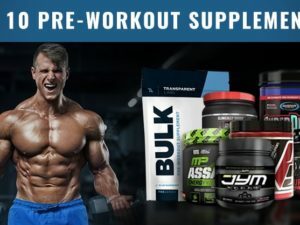 This is similar to our experience with Vega’s Sport Energizer pre workout, while the Vega name is strong, their formulations are not as competitive as you’d expect. The Enlightened brand takes a new approach to their chips, using beans as their base, rather than corn, flour, or milk concentrate. Hence the name, Bada Bean Bada Boom. We like this new angle on chips, since beans are historically healthy… However, you’re getting about 10 grams net carbs per serving that pinch some diets out. Ingredient wise: Bada Bean Bada Boom chips are made primarily of fava beans, sunflower oil, and rice flour. Flavor wise: Expansive flavor options. Overall, Enlightened brand brings a new take and texture to protein chips that is sure to be loved by many vegans and meat eaters alike. Simply Protein has very attractive advertising with their Crunchy Bites chips, however that doesn’t change the fact that they contain about 10 grams of carbs per serving. Compared to the other protein chips we’ve reviewed here, that’s on the high side which makes Crunchy Bites less attractive for diets with little wiggle room. Ingredient wise: Crunchy Bites are mostly made of pea protein isolate, potato flakes, and potato starch. Flavor wise: Crunchy Bites come in barbeque and sea salt & vinegar. Overall, Protein Crunchy Bites brings us a tasty pea-protein based option for those that can have extra carbs in their diet. Muscle Chips by Wholesome Provisions provides baked tortilla chips that net 13 grams of protein and 5 grams carbs per serving. Compared to standard chips, that’s a pretty big win, cutting down on the trans fats and carbohydrates at the same time! Ingredient wise: The main ingredients are vegetable fiber, wheat protein, and wheat gluten. Flavor wise: One standard flavor option. Overall, Wholesome Provisions provides a healthful option for tortilla chips. These chips do contain gluten, modest carbs, and 6 grams of fat. But they are also baked rather than fried and contain 13 grams of protein per serving. Protes is a more common name in the high protein chip world. Instead of whey protein or increased potato starch, Protes contain pea protein isolate to enrich the potato. The result of this is 15 grams of protein per 120 total calories at 4 net carbs. Ingredient wise: The primary ingredients are pea protein and potato. Flavor wise: extensive list of flavors. Diet: Vegan friendly, low carb. Overall, Protes are a reliable option that are likely to be here for quite some time. Despite not quite making the keto cutoff, they are vegan friendly and a good cheat-day item. Our top choice comes down to the one brand that has always done low-carb right, Quest Nutrition. Their protein chips manage to pack in 18 grams of high quality protein, while only netting 4 grams of carbs for a total of 140 calories per serving. Ingredient wise: the main ingredients in Quest chips is Milk/Whey protein isolate and high oleic sunflower oil. Flavor wise: Quest Protein Chips come in a nearly limitless flavor selection. Overall, Quest Nutrition provides the greatest protein to carb ratio of all true chips. While that doesn’t qualify them as inherently healthy, it does make them less unhealthy than other protein chip contenders and way less unhealthy than standard chips. We hope that this article has shed greater light on the uses for protein chips in a health-focused diet. Ultimately, our highest recommendation for increasing protein in a healthy way is to first get more from your real-food diet, second healthy whey protein, and third options like chips and other high protein ‘cheat’ snacks. Now, we have an important request. If you’ve tried any of the brands that we’ve mentioned above – please comment below with your experience plus what you liked / didn’t like. It’s important that other people leave their feedback to add perspective and better help new dieters.